Just when it looked like this Thursday’s Metro board meeting would just see its high-stakes up-or-down vote on proposed fare increases, a new wrinkle emerges: a new Metro board motion [pdf] by Mayor Eric Garcetti and Supervisors Zev Yaroslavsky and Mark Ridley-Thomas. The bottom line on the motion is that a 25-cent fare increase would go forward for September 2014, but with some relatively positive strings attached. From the way the new motion is written, it’s not procedurally an alternative to the fare increase, but instead a sort of tag-along modification that comes after fare increases. The Garcetti-Yaroslavsky-Ridley-Thomas motion more or less assumes that the fare increase gets approved. While there are worthwhile modifications in the motion (see below), the implication here is that the fare increase itself appears likely to pass, given that the mayor controls four Metro board votes and the two other sponsors are likely to vote for it as well. Here are excerpts from the motion, with SBLA analysis and commentary interspersed. • Adjusting MTA fares annually consistent with the Consumer Price Index instead of stand-alone fare increases. Though there are some non-binding wiggle-words like “should,” the preamble generally comes down on the side of livability, equity, and organizational efficiency. It’s not always easy to figure out what Metro is talking about in Board Motions, especially when projects and budget lines have different names. 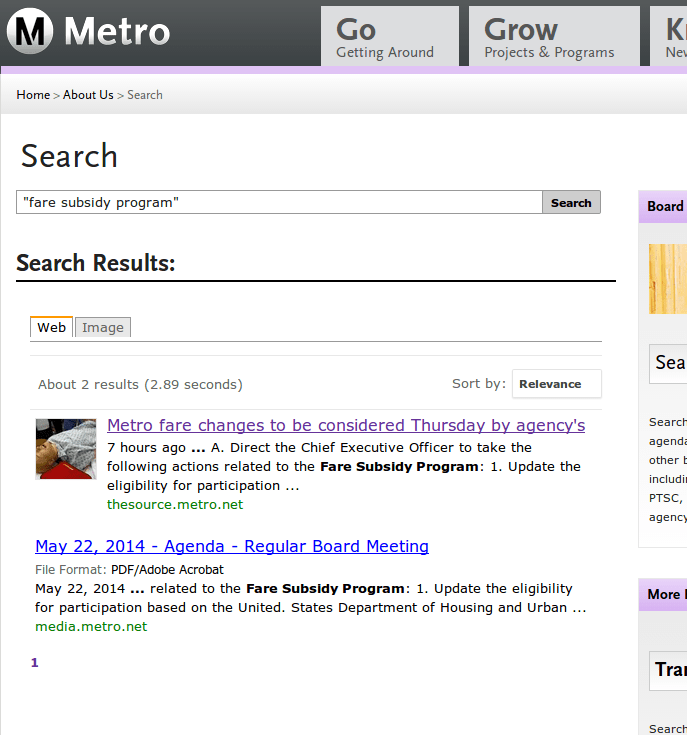 For example, a search for “Fare Subsidy Program” on the Metro website provides links only to articles about, and a copy of, this motion. After the first publication of this article, SBLA staff confirmed that this program, called RRTP, for “Rider Relief Transportation Program,” is basically a subsidy program for people of lesser means… although oftentimes it is not enough for them to buy a monthly pass. The Metro fare increase proposal would raise student fares over time, proportionally faster than base fares. Freezing the student fare is a step in the right direction – much preferable to an increase. This freeze is probably the single most important aspect of the motion, with far-reaching implications on the future of Los Angeles youth. It would, however, maintain the current status quo–which has been criticized (including in the language of the motion’s preamble)–for criminalization of youth. The county’s Education Coordinating Council has called for free student transit fares. The motion further directs Metro to establish a “comprehensive diversion program” including an “online educational diversion program and/or [participation] in community service in lieu of fines and court appearances.” The devil will be in the details on how comprehensive and effective these programs will be. Online programs may not be easily accessible to this population. Metro would need to invest resources to make diversion effective. Perhaps some up-front investments would be even more effective. Instead of diversion after fare evasion citations, Metro could provide easy-to-obtain free (or very affordable) student transit passes, reducing the need for diversion. Even with a student fare freeze, more steps would need to be taken to ensure that Metro adequately serves L.A.’s student population. Examination of agency best practices is welcome. SBLA often raises examples of how other cities and regions are implementing facilities and practices that would make sense in Los Angeles. There are things Metro does right, but there is more to learn. Again, the devil will be in the details. Will this be a rubber-stamp task force, or a far-reaching reform process? Will Metro invest the resources needed to make the Task Force effective? Or would Metro be better off investing those resources, in, say, cheaper fares? The “postponing” of 2017 and 2020 increases until a “2015” committee is convened rings hollow. Is this actually a postponement, or is that just rhetoric? Once the current fare increase heat subsides, will Metro board leadership ensure that this process leads to results? All in all, while it rounds a few sharp edges off the fare increase, this motion, like many, aspires to more than it actually commits to. While the Garcetti-Yaroslavsky-Ridley-Thomas motion throws just a few worthwhile bones to the critics aligned against the fare increase, it doesn’t appear to portend any major re-alignment of Metro’s proposed fare increase. The fare increase, this addendum motion, and more will all be decided at this Thursday’s 9:30am Metro board meeting. Follow the proceedings at @StreetsblogLA on Twitter. You have to go to a social service agency and it’s really confusing. I’ve never gotten around to it myself. I don’t get why they can’t just streamline this via a paper or online application or let you apply when you get food stamps or things like that. Honestly, I don’t see how the fare increases will hurt most that pay full fare, as most would pay less (since transfers become free for 90 minutes). Most people taking the Blue Line have to transfer to get to their destination, and I’m sure that’s true with the Gold and Expo line riders as well. Admittedly, I’m unclear how this does much of anything other than give the opponents of the fare increase another opportunity to go after Metro three years from now much as they are now (and again three years later). In the meantime, Metro isn’t covering its entire future deficit with fare dollars and will have to come up with more money from somewhere (fed’l gov’t is not too helpful in that department – you’ve been reading about the highway trust fund, right?). All this appears to do is kick the proverbial down the road (and not very far down the road at that). Meanwhile, Metro will probably still have to contemplate and possibly implement service cuts to stave off future shortfalls since there’s no guaranteed fare increases beyond this year. The City of Los Angeles used to have a pass subsidy program for years for seniors until LADOT decided to use that money to fund dial a ride and DASH instead. Many other cities, including West Hollywood http://www.weho.org/home/showdocument?id=12305 , Redondo Beach http://www.redondo.org/depts/recreation/transit/bus_pass_subsidy/default.asp , and South Pasadena http://www.cityofsouthpasadena.us/index.aspx?page=82 subsidize fares for seniors, if not the general public.